In 2016-2017, Rukiye Huseyn Demir came to Gaza from Turkey with an aspiration to meet strong women who are working in several community fields, support them in reality and throughout her words. The Islamic University did embrace her ambition, so Rukiya received a full scholarship to study the Master degree in IUG Faculty of Education. 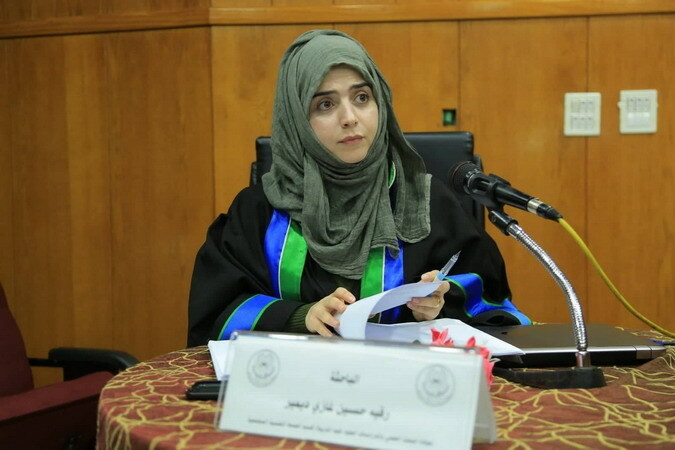 The early pages of 2019 have witnessed the graduation of Rukiye from IUG Psychology Department, holding the master's degree entitled, "Self-Perception and Coping Strategies for Women in Man-Dominated Professions in Gaza". The research recommended that providing professional development program for policing would be so efficient, which includes how to keep the balance between home and work, education on the importance of women in policing and morality in policing to increase self-perception of policewomen. As a relationship between Islamic moral and Global, self-worth was found quite strong. To improve the self-perception of policewomen, some educational programs on Islamic moral can be implemented. This program can be weekly to remind police officers on the importance of their existence on the earth. By that, police officers may keep on having higher self-perception, even under the hardest situations. Moreover, the government should pay more attention to the needs of women in man-dominated professions with the necessary tools, expenses, and opportunities in Gaza, Palestine. Palestinian government should provide a more comfortable working environment for policewomen to help them to achieve their goals for the goodness of the community. Words fail to describe Rukiye's happiness in the moment of announcing her success. By little words and much eagerness, she said, "I'm looking forward to holding a doctorate degree from Qudos". Rukiye is one of the Turkish people who are passionately fond of Jerusalem and Palestinians. Continuing her support to women, she, Rukiye, put her eyes directly on the women who are resisting and struggling in Jerusalem, so her doctorate's research will be on Jerusalem women and their role in defending Palestine.